Both top- and front-load washing machines have metal drums that you must secure before you move the appliances. The metal drum inside a washer holds the clothes; it's where the washing takes place. The balanced drum spins to remove water from the clothes during part of the wash cycle and rocks on its axis to accommodate a bit of imbalance. Moving the washing machine before properly securing the metal drum can result in drum misalignment, which will render the machine useless until repaired. The drum in this front-loader is horizontally placed. Stop using your machine machine a few days prior to moving. 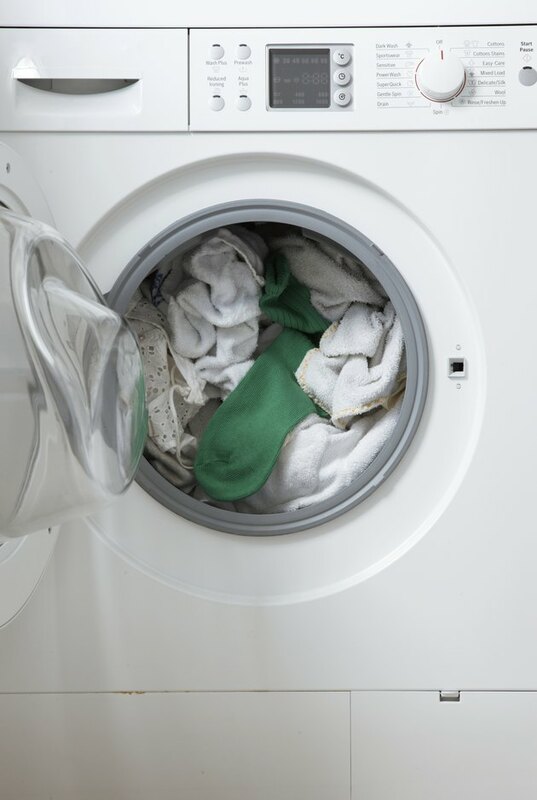 Leave the door of the machine open and allow it to dry as much as possible. Unplug your washing machine and detach the water supply and drainage lines from the rear of the machine using your wrench. Move the back of your washing machine away from the wall so you can clearly see and easily reach the back panel. Locate the four holes, one at each corner, on the back panel of the machine. The holes may or may not be marked "Shipping Bolts." Insert one shipping bolt into each hole and fasten them into place using your wrench or screwdriver. The bolts came with your machine and were removed from these four holes upon installation. With the bolts tightened, your washing machine drum is secure and ready to move. Tilt your top-loading washing machine over at an angle to allow any standing water to flow out of the drainage opening. Place a towel over your water supply hose ending and hold it in place with a rubber band. Lay the covered end of the hose inside the washing machine drum. Can a Washing Machine Be Transported on Its Back?